The "411 On Fishing" : Up Hill or Down Hill - “Which is the best direction to troll? Up Hill or Down Hill - “Which is the best direction to troll? In calm conditions like this it’s pretty easy to troll in any direction. When the wind picks up however, it’s often easier to troll with the wind. 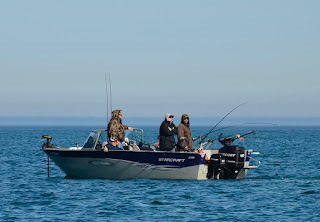 When I’m on the water trolling for walleye, trout, salmon or another species, I marvel at how often other boats seemingly breaking all the rules of common sense. Nowhere in the “trollers manual” does it state we must always troll downwind or upwind, but there are for sure times when doing so not only makes the most sense, it can make your time on the water a lot more productive and enjoyable. Fishing “uphill”, into the waves or “downhill”, with the the wind is one of those topics anglers are constantly debating. Understanding the dynamics of trolling can make it easier to decide which is the best course of action. 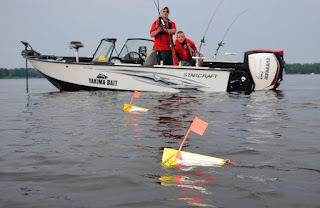 Trolling downwind or with the waves makes sense in a number of trolling applications. The benefits to trolling with the wind are many. First and foremost on a downwind troll the boat is controlling itself, freeing up all the occupants to set lines, fight fish, change out lures or lead lengths. In a downwind troll the boat will follow a predictable course without having someone stationed at the helm constantly steering the boat. It’s also much easier to set and maintain a particular trolling speed when fishing with the waves. For certain trolling applications -- spinner fishing for walleye -- dodger fishing for lake trout -- it’s critical to maintain a specific speed. Trolling downwind the boat flows through the water with less surging and resulting in more consistent trolling speeds. a lot of time trolling. 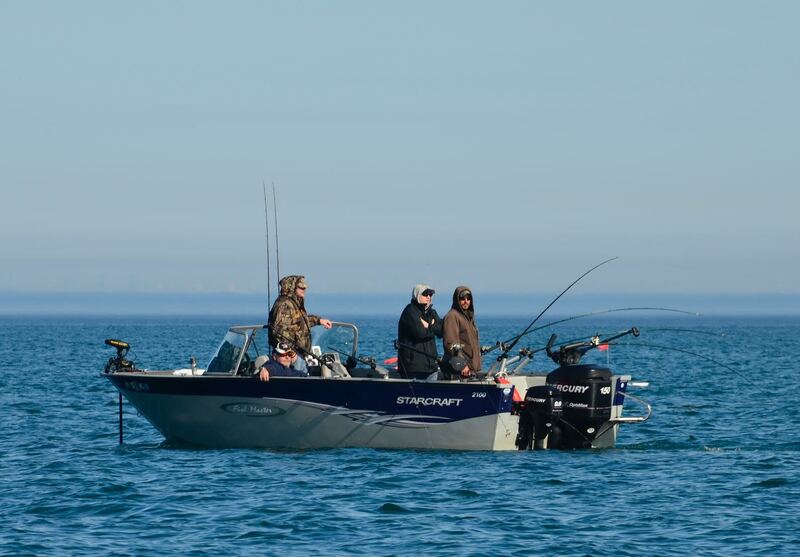 Unfortunately, at some point the boat is going to pass through the school of fish and a decision will have to be made to either pull up all the gear, run back upwind and set up for another pass, or to simply turn around and troll into the waves. The right decision here depends a lot on wave conditions. In calm conditions it’s a simple task to turn the boat around and troll back to the fish. However, when faced with even a moderate wind and waves, trolling back into the waves creates a situation where it can be almost impossible to duplicate what was working on the downwind troll. As much as it forces the angler to work harder, pulling your gear, running back upwind and setting up another downwind pass is often the best decision. Anglers who fish from larger boards equipped with an auto-pilot are the exception to this run. A larger boat can almost perfectly match trolling speeds when fishing upwind and downwind. Small boats need to pull up their gear and make another downwind pass. Trolling into the waves has a time and place as well. Certainly controlling the boat and keeping a steady course and trolling speed is more difficult when trolling into the wind compared to with the wind. An auto-pilot is the best way to troll into the wind and keep the boat under control. of waypoints directly in front of the boat. Fortunately there are a number of auto-pilot designs that enable a host of boat types to fish under control. An auto-pilot can be rigged to virtually any boat with an I/O, inboard or outboard power. 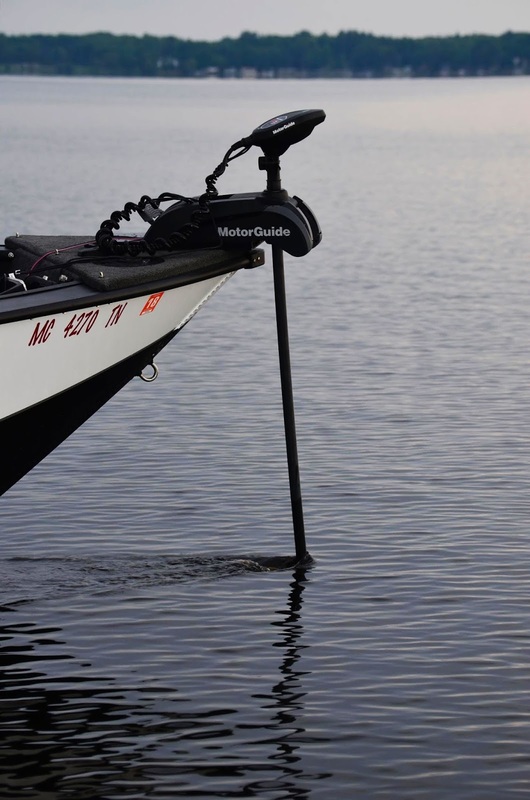 Even kicker motors and electric motors have auto-pilot functions these days, which means any boat big or small can be equipped with an auto-pilot. Without the help of an auto-pilot, trolling into the wind is going to require someone to man the helm constantly. This is a thankless job and the best option is to take turns so everyone in the boat gets a taste of how difficult it can be to troll into the waves and keep the boat under control! The other issue associated with trolling into the wind is many anglers don’t realize that their trailing lures are not running as deep when they troll upwind as they do when trolling downwind. The reason for this is wind causes a surface current to form. Trolling into this current, lures and trolling lines are subjected to more friction which in turn reduces the diving depth of lures and trolling gear. 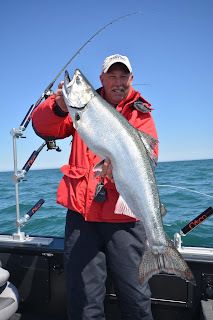 On average a troller can expect that his gear is fishing about 10% shallower when trolling into the waves, compared to trolling downwind or with the waves. A good rule of thumb to follow is to avoid trolling into the wind when fishing gear that sinks and or is speed dependent. 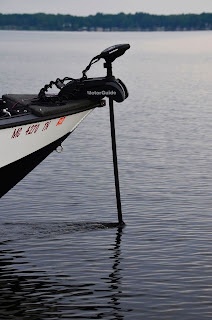 For example, it’s pretty tough to fish a bottom bouncer/spinner rig into the wind because minute changes in trolling speed and boat direction will make it impossible to keep the bouncer on bottom and fishing properly. Trolling into the wind with gear like crankbaits that float at rest and dive when pulled can be exceptionally effective. Because most crankbaits float at rest, there is no fear of these lures sinking down and snagging bottom while trolling into the waves. Also, trolling into a sea gives crankbaits a more erratic action that often triggers more strikes. the most efficient means of finding and catching fish. determine which direction is the best to troll. Because crankbaits can typically be trolled at a wide range of speeds, these lures often perform well when fishing into the waves. In cold water however when it is necessary to troll crankbaits at slow speeds, it’s typically best to run back upwind and set up with a downwind trolling pass. Often a troller is faced with the need to follow a particular piece of structure to stay on fish. Often staying on this structure requires trolling not necessarily into or with the wind, but fishing in a quartering sea. Charter captains refer to this as “fishing in the ditch” because the boat isn’t going directly into or with the waves. The boat ends up spending a lot of time in the troth and unfortunately each side of the boat is not moving at the same speed. This leads to a situation known as “crabbing” which in turn leads to fish being caught on one side of the boat more frequently than the other. Crabbing is “okay” to a degree, but when only one side of the boat is fishing effectively, the trolling presentation is compromised. It’s best to avoid crabbing, but when fishing structure that demands fishing in the “ditch” to stay on fish an angler has little choice. Trolling is one of those games that has rules, but the rules are sometimes blurred. It seems that for every rule of trolling there is an exception to that rule. Clearly it would be unfair to say it’s always better to fish downwind or upwind for that matter. In trolling, the angler has to access the situation, the gear being fished and make an educated decision to fish uphill or downhill.